FREEDOM Progressive Resting Splint is appropriately rigid for splintering yet malleable enough so that it can be custom modified to the patient by simple bending. 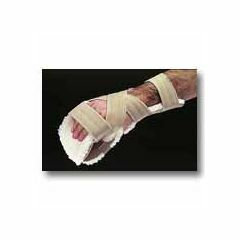 It is supplied as a standard neutral functional resting splint -- you bend it in the right areas to ensure a custom fit. Strapping is an integral part of splint performance. Figure-eight strap configuration ensures this splint can withstand contracture forces that may be encountered. Soft AliFleece cover has all necessary straps sewn on. Under the removable cover, the splint features a perforated Plastazote® #1 resting surface and a hook-sensitive underside exterior layer. Sizing: Measure circumference of the hand at the MP joint. Small/Medium, 6 ½" - 8"
Medium/Large, 8" - 9 ½"